Last month, a microbiology lab in Nottingham, England made international headlines when it unearthed a substance that kills methicillin-resistant staph, one of the deadliest superbugs of modern times. The most astounding part about the find? It was a 1,000-year-old Viking potion. Bald’s eye salve, intended to vanquish a stye, was discovered in Bald’s Leechbook, an Old English medical primer that hails from 9th century England. The recipe, which claimed to be “the best leechdom” in existence, caught the eye of Freya Harrison, a microbiologist at the University of Nottingham who moonlights as an Anglo-Saxon warrior on the weekends, as a member of the UK’s oldest and largest Viking reenactment society. Together with microbiologist Steve Diggle, the three pooled resources to begin the “AncientBiotics” project, which would identify promising Anglo-Saxon remedies and test their medicinal value using modern science. They never expected their first attempt at replicating a medieval potion would be such a roaring success. Medieval medicine is generally perceived to be little more than quackery—at best, useless, and worst, a death sentence in itself. We picture doctors bleeding patients to dispel ill humors, or drilling holes in a their skulls to release evil spirits. And we picture the Black Death, images of the sick and dying living out their final days in isolation, towns lined with massive pile of festering bodies. All in all, if you got sick, you were basically screwed. Right? Lee, who’s been studying Anglo-Saxon medicine and burial rituals for years, suspects that the reality might have been more a bit more complex. During her PhD studies, she visited a number of Anglo-Saxon cemeteries, where she was surprised to discover that diseased bodies were often buried with an enormous amounts of care. During the Middle Ages, infections were one of the primary killers. Untreated cases of pink eye led to blindness, minor flesh wounds became gangrene, and child birth was, as often as not, a death sentence. We hadn’t a clue what caused these afflictions, but still, people tried their best to come up with treatments. 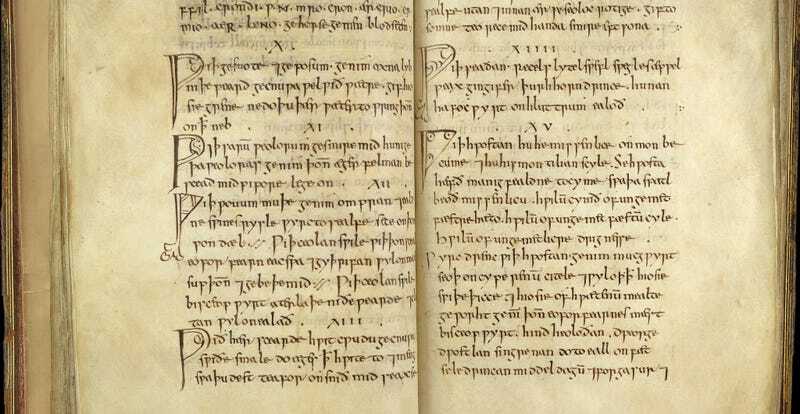 One of the most prominent medicinal compendiums of the 9th and 10th century is Bald’s Leechbook, compiled under the auspices of Alfred the Great and circulated in Winchester, on of the largest Anglo-Saxon cities of the time. Within the book’s pages are hundreds of treatments, for everything from headaches to impotence to paralysis. While some of these remedies reek of BS (one, for instance, describes pounding a charred wolf’s skull to a powder and applying it to sore joints), many require nothing outlandish at all, and what’s more, contain ingredients that are know today to have antimicrobial properties. Early on in their discussions, it became clear to Harrison and Diggle that some of these recipes might have potential. Work an eye salve for a wen, take cropleek and garlic, of both equal quantities, pound them well together, take wine and bullocks gall, of both equal quantities, mix with the leek, put this then into a brazen vessel, let it stand nine days in the brass vessel, wring out through a cloth and clear it well, put it into a horn, and about night time apply it with a feather to the eye; the best leechdom. “This recipe specifically says it’s for a lump in the eye, which to us, clearly suggested it was used to treat a stye,” Harrison said. “In the modern world, about 90 percent of sties are caused by the Stapholococcus auerus.” This gave the researchers a clear target to test the potion against. The ingredients themselves—cropleek, garlic, wine and bullocks gall, or cow bile—were another selling point. Copper, it so happens, is also an antibacterial agent. To find out, the researchers set about recreating the potion. Sourcing authentic ingredients was a major challenge, since many crops have been hybridized or altered through selective breeding programs over the past thousand years. “Take the wine,” Harrison said. “Virtually all wine grapes have now been hybridized with a North American variety, so they’re different than what people had in the 9th century. So we decided to focus instead on making sure the geology was correct, since different soil minerals can affect what’s in the wine.” In the end, the team found a historic organic vineyard six miles from the site of a 9th century vineyard, and purchased a vintage bottle. “Cropleek” was also a bit of a head-scratcher. The word is thought to refer to an allium species, the genus that includes onions, garlic, shallots and leeks. Which specific onion-plant, however, is not known. In the end, the researchers fixed on leeks and onions—both of which produce flavanoids, a class of molecules that might also possess antimicrobial properties. Instead of cooking the potion up in a bronze pot, which would have been difficult to sterilize (and expensive) the researchers cut up strips of bronze and placed them inside glass bottles. After nine days of stewing, the slimy, garlicky paste was self-sterilizing, and would kill laboratory strains of Staphylococcus in liquid media. Next, they tested it out in a more realistic wound model, a biofilm of staph grown in a semi-solid agar gel. When the potion still killed everything it touched, it began to dawn on the researchers that they might have stumbled onto something big. At that point, they called a up colleague at Texas Tech University, who tested the potion in actual mouse tissue, again with phenomenal results. Finally, they decided to test it against the thoroughly modern and drug-resistant MRSA strain. Sure enough, it brought swift death to the hardy bugs. Even with all the buzz their potion has generated, the team is cautious not to label their discovery as actual medicine (the paper that details these findings is still under peer review). The discovery is exciting, but the potion hasn’t even made it to clinical infancy yet. Moreover, they still have no idea how Bald’s eye salve actually works. Still, the team is already considering testing more potions from Bald’s Leechbook and other medieval texts. A logical starting point is to search for other recipes that harbor similar combinations of ingredients—garlic and wine, for instance. But some completely different recipes have also caught their eye: A treatment for paralysis, for instance, calls for birch bark, which contains a possible cancer-fighting compound. While all of the recipes the group is investigating are in Old English, some are translations from classical sources. These are also a high priority, having been passed along for many generations. Which is to say, while we’ve been accidentally killing people in the name of medicine for thousands of years, we’ve also been amazing breakthroughs along the way. And personally, you don’t need to tell me twice to consume more garlic and wine.